As Logan is getting older, I'm looking for more ways to make him independent. Mornings are our biggest challenge, particularly on those days he sleeps in then wants to take his time getting ready (not that I'm complaining that he slept in :)). 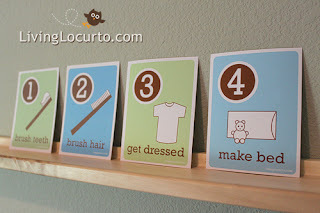 Living Locurto has some ideas that I think he'll grow into, making the before and after school routines easier on both of us! Click the photos below for the free downloads! Thanks to My Little Gems for the link!